Jordan Brand will be releasing a Spider-Man edition of the Air Jordan 1 dubbed, “Origin Story” as a nod to the pair of Air Jordan 1s that Miles Morales is wearing in Marvel’s Spider-Man: Into the Spider-Verse movie. Dressed in a Chicago-like color scheme, the shoe comes in a mix of Gym Red, Black, White, and Photo Blue. It features a textured reflective upper paying homage to Miles Morales costume. An iridescent-styled Nike Air tongue label gives the shoe an OG-vibe, while sitting atop an icy sole. 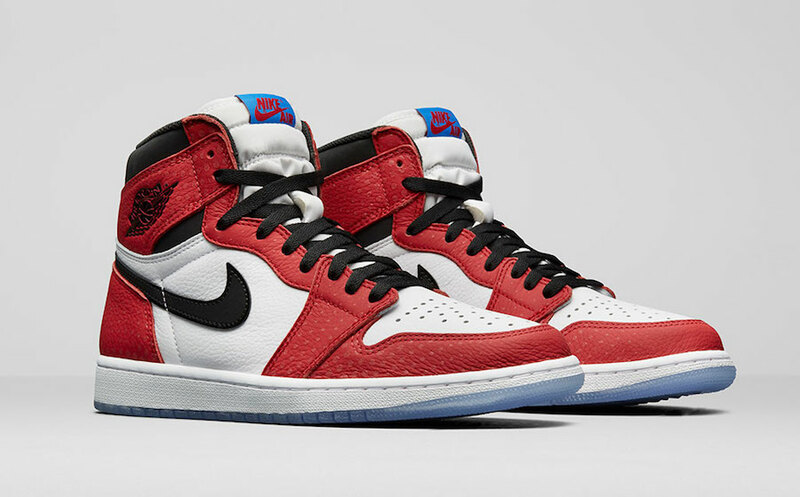 Early access to the Air Jordan 1 Retro High OG “Origin Story” will release tomorrow, December 1st in LA at Spider-Verse movie premier. A wider release will go down in full family sizing on December 14th at select retailers and Nike.com. The retail price tag is set at $160 USD. UPDATE: Shameik Moore who plays the voice of Miles Morales in the animated film, Spider-Man: Into the Spider-Verse recently sat down with Jordan Brand for an interview. But before he did, Jordan Brand laced him up in the “Origin Story” Air Jordan 1s, which you can see below. For those interested, you can check out the full interview here. UPDATE: Nike releases official photos of the Spider-Verse inspired “Origin Story” Air Jordan 1 that will release on December 14th in full family sizing.